Double-A Corpus Christi can put a star next to Friday's date in the calendar. 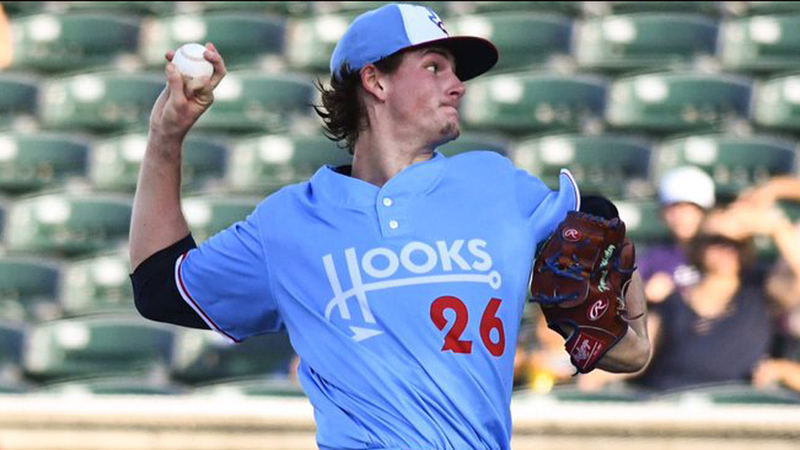 Forrest Whitley, the Astros' top prospect, turned in four scoreless frames in his season debut and Randy Cesar extended his hitting streak to a Minor League-best 30 games as the Hooks routed the Frisco RoughRiders, 11-1, at Whataburger Field. Making his first start since being suspended 50 games for violating the Minor League Drug Prevention and Treatment Program, MLB.com's seventh-ranked prospect allowed one hit and fanned five without issuing a walk. He capped the season bow by punching out the side in order in his final inning. "The command was pretty good with all pitches," Corpus Christi manager Omar Lopez said. "His changeup was plus tonight ... he threw some sharp sliders and his cutter was working pretty well." Whitley threw 55 pitches, 37 for strikes. Lopez said his maximum was set at 65. "There was not enough pitches left to send him back out for the fifth," Lopez said, who added Whitley will be extended to about 75 pitches in his next start. A slew of rainy days at the Astros' Spring Training complex during extended spring training made it difficult for Whitley to accrue innings during his suspension. But Lopez was impressed with his stamina in his first outing back, although his overall performance was not shocking. "It was actually pretty hard to build him up," Lopez said. "They've done a pretty good job of building him up to 65 [pitches]. "I was expecting that type of outing because I know he's the type of kid to work every single day. ... It seems like all the work he put in at West Palm gave the Astros the green light to send him straight here." The 2016 first-rounder turned 20 last September, having climbed three levels in his first full season, throwing 46 1/3 innings with Class A Quad Cities, 31 1/3 with Class A Advanced Buies Creek and 14 2/3 with Corpus Christi. Overall, he was 5-4 with a 2.83 ERA and 143 strikeouts over 23 games -- 18 starts. Cesar's seventh-inning single through the left side sparked a five-run frame for the Hooks. During his 30-game hitting streak dating to May 5, he's batting .387 with a .420 on-base percentage, seven home runs, five doubles and a triple. Lopez said Cesar began trending upward at the midway point last season. "He was trying to do too much at the plate," the skipper said. "We talked to him about hitting first, because we remember [Cesar]'s trend was to the opposite side of the field. "He was putting that off, trying to do too much. By the second half last year, he started to simplify his approach to the plate and then he came to Spring Training and he started to do the same." After going 1-for-5 with a run scored Friday, the native of the Dominican Republic leads the Texas League with a .352 average. Teammate Taylor Jones -- who went 2-for-5 with an RBI triple -- is one point behind Cesar and No. 20 Houston prospect Myles Straw gained on them with a 3-for-5 performance that gives him a third-best .344 average. Straw also stole his Minor League-leading 35th base and scored twice while Alex De Goti went 2-for-4 with two homers and four RBIs. Josh Rojas smacked a two-run homer on a 3-for-5 night and Ryne Birk was 3-for-3 with an RBI.